For the past few years, pollsters have asked about a thousand or so Americans the same question: Does the government have an obligation to ensure all Americans have health care? They’ve found a remarkable shift, with Americans swinging sharply toward the belief that the government ought to play a very large role in the health care system. 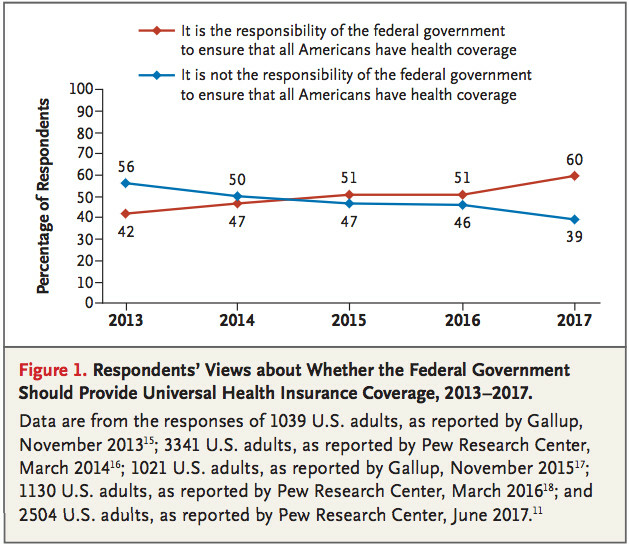 Specifically, the percentage of Americans who think the government has an obligation to ensure coverage to all citizens has risen from 42 percent in 2013 to 60 percent in 2017. An 18-point swing in just four years is a remarkably fast change in the world of public policy polling. “When we reviewed everything, nothing else in our data was close to 18 points,” says Harvard’s Robert Blendon, who published the data in today’s New England Medical Journal. To put that in context: Although much fanfare has been made out of improving views of the health care law, when Blendon averaged together national polling, he found the law’s favorability ratings had only risen 5 percentage points. Blendon attributes the change in attitudes to Americans thinking through the consequences of repealing the Affordable Care Act, resulting in millions losing coverage. The question didn’t ask about Obamacare specifically, a highly polarizing law. Instead, it asked generally about the government’s role in providing coverage. His article also finds that government health programs, like Medicaid, generally poll better than the expansion of private coverage through insurance subsidies. Most Republican voters say they do not want to cut the number of people covered through Medicaid, the public program that provides health insurance to low-income Americans. But most Republicans were open to cutting subsidies for private insurance.